MANILA, Philippines - 'Bagyong Agaton' has slowed down slightly and is now heading towards the West Philippine Sea, state weather bureau PAGASA announced in its 5:00 a.m. update on Wednesday, January 3, 2018. At 4:00 a.m. today, the center of Tropical Depression 'Agaton' was estimated based on all available data at 175 km West Northwest of Puerto Princesa City, Palawan(10.1°N, 117.2°E). 'Bagyong Agaton' has maximum winds of up to 55 kph near the center and gustiness of up to 65 kph. It is forecast to move West at 25 kph. All Tropical Cyclone Warning Signals are now lifted. 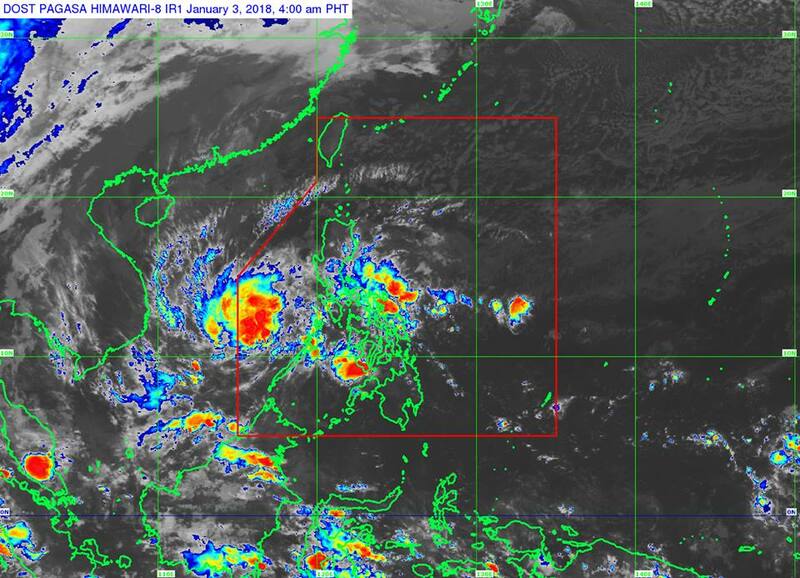 On Thursday morning (January 4), 'Agaton' is expected to move outside the Philippine Area of Responsibility (PAR) or 310 km West of Pagasa Island, Palawan (11.4°N, 111.3°E). Moderate to heavy rains is expected over Visayas, Bicol Region, Palawan and Quezon due to trough of 'Agaton' and Tail-end of a Cold Front. Residents of these areas must undertake precautionary measures against possible flooding and landslides and coordinate with their respective local disaster risk reduction and management offices. Sea travel is risky over the seaboards of Northern Luzon and Southern Luzon, eastern seaboard of Central Luzon, eastern and western seaboards of Visayas, and eastern seaboard of Mindanao due to the surge of Northeast Monsoon and the current weather system.